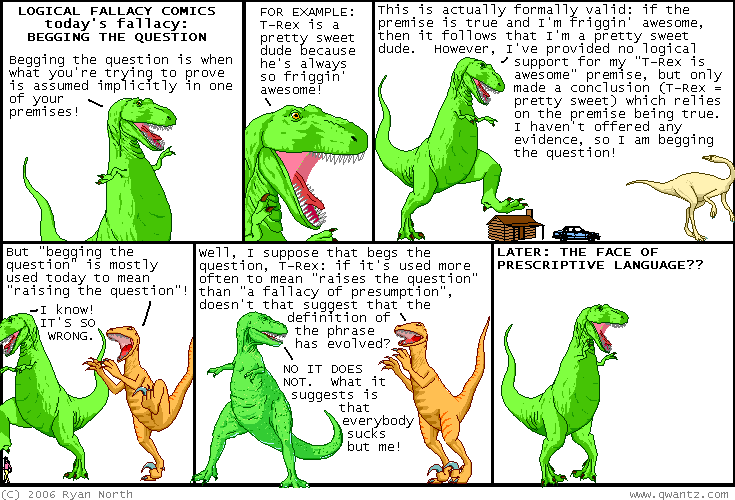 ‘assuming the conclusion’ is not a fallacy in the sense that the form of argument involved is invalid. The cases that are condemned as petitio principii pretend to reason from accepted premises to a novel conclusion, while actually smuggling a disguised form of the conclusion into the argument’s assumptions. That’s what beg the question has traditionally meant. To see what else it can mean, and whether these other meanings are acceptable, good modern dictionaries are the best place to start. Dictionaries include the two main senses (raise the question; assume the conclusion in the premise), and some also include the third (evade the question): see Oxford, American Heritage, Macmillan, Merriam-Webster, Collins, and Cambridge. None marks the newer senses as non-standard; indeed, the AHD includes a usage note that predicts they will ‘probably continue to flourish’. Beg the question first appeared in English in a 1581 text of Aristotle’s Prior Analytics, and this translation has had semantic ripples down the centuries. The phrase is opaque because its use of beg is really not a good fit – it’s no wonder people have interpreted it ‘wrongly’. Had the original English translation been assume the conclusion or take the conclusion for granted instead of beg the question, there would be far less uncertainty and vexation. Jonathon Owen, James Callan and Tom Freeman confirmed my impression, saying they saw it used to mean raise the question about 90%, 95% and 96.5% times, respectively. The traditional use was approximated at 0.1% and 0.5%. Mignon Fogarty, aka Grammar Girl, told me she looked at a lot of examples when researching the phrase for a book, and found no cases of the traditional use. Next I searched for beg* the question on GloWbE, a modern corpus of 1.9 billion words from websites in 20 English-speaking countries. It offered a range of grammatical contexts: begs (3051), beg (501), begging (398) and begged (87) the question. I looked at 300 examples of the most popular construction, which seemed a fair way to gauge patterns in contemporary use in different registers and populations. 269 out of 300 examples of begs the question used it to mean raises the question, more or less. That’s 90%. This figure show its huge predominance in contemporary discourse. Outside of formal debates and philosophical or semi-philosophical contexts, the traditional meaning of beg the question is hardly ever used. The evade the question use is rarer still. This is why insisting on the original use, as prescriptivists do, risks confusing many readers. It’s not a practical or constructive stance. Correctness changes with sufficient usage, yet sticklers still refuse to accept there can be more than one way to use this phrase. By adopting the tenets of one phrase → one meaning and original meaning = true meaning, they have painted themselves into a corner. The disparity between what is prescribed and what is done leads to awkward inconsistencies. Publisher style guides insist on the niche, rarefied use of the phrase while their writers use it in the more common way regardless. The Economist style guide says: ‘Beg the question means neither raise the question, invite the question nor evade the answer.’ But counter-examples here and here (since changed) suggest not only that some Economist writers are unaware of or indifferent to the shibboleth, but that some of its copy editors are too. The Guardian style guide says beg the question is ‘almost invariably misused’ and that the original sense is ‘being lost, which seems a sad fate for a phrase that might be useful or even – in a logical or philosophical context – essential’. But this is unduly pessimistic. Anywhere the esoteric sense is essential, it will be retained, as my corpus search suggests. Philosopher Matthew McKeever told me he ‘very seldom’ sees the traditional sense outside of philosophy and never sees the raise the question sense in it. His search of philosophy papers supports this. Words and phrases often fork semantically, with a specialist sense retained in specialist contexts and a different sense emerging in general use. This is nothing to lament – and any claims of ambiguity and confusion require real-life evidence, not worries and sentiment. 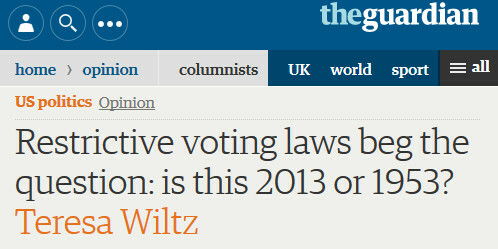 The Guardian has been agonising over the phrase for a while. In 1999 readers’ editor Ian Mayes found that its use in the newspaper was ‘very rarely’ the original one. A decade later David Marsh wrote that in 35+ years in journalism he could recall just one occasion when beg the question referred to the logical fallacy – the writer was a philosopher – and in 33 of the last 33 it meant raise the question. Which raises the question why the style guide – or any guide outside of philosophical or similar domains – persists in outlawing the overwhelmingly popular usage. Is polysemy so anathema? It’s a similar story in the US. The New York Times’ usage and style blog After Deadline flags the phrase’s ‘misuse’ again and again. Admitting a ‘losing battle’, it still ‘refuse[s] to surrender’ the point. This stubbornness may incorporate a concern that accepting the newer senses means forsaking or devaluing the old, but it doesn’t: it just makes publishers look intransigent, inconsistent, and sceptical of readers’ flexibility and language’s complexity and versatility. And it’s not a losing battle: it’s lost. And battle is the wrong metaphor. The evade the question sense seems to have more support from usage authorities than the raise the question one. This may be because it’s older and semantically closer to petitio principii – by assuming the conclusion in the premise, one evades the question. But this sense is rare, while the raise the question sense is almost ubiquitous and surely destined for standard status. It cites examples from books and reputable publications like Atlantic and Time begging the question(s), the difficulties, and the point, meaning essentially ‘to dodge or sidestep the issue’, and says this usage is ‘fully established as standard’ – a conclusion contested by Bryan Garner and other traditionalists. In his Dictionary of Modern American Usage, Garner rejects the common usage as a mistake and says people using it in the evade sense misapprehend its meaning. But Garner and the other prescriptivist critics are themselves begging the question. They assume the phrase has a single meaning, the one they prefer, when it demonstrably has multiple meanings. If you doubt this, consult any good dictionary. So how should we use beg the question if, as Michael Quinion says, no two authorities fully agree on which senses are acceptable (or even on the nature of the problem)? Using it to mean raise or evade the question will bother some pedants and learned readers, but is theirs a legitimate grievance given the huge proportion of people using it to mean raise the question? Using it to mean assume the conclusion will puzzle many readers, unless you’re writing in a philosophical context or are sure of your audience. The expression is ‘skunked’, to use Garner’s term. Grammarphobia agrees that it’s ‘virtually useless’, and Mark Liberman recommends avoiding it altogether. In formal use I advise caution for this reason, but in everyday use you’ll encounter little or no difficulty or criticism with the raise the question usage. Eventually the contention may abate enough that the phrase can be used in edited prose without annoying, confounding, or distracting a significant number of readers. Until then each writer must decide for themself based on context, audience, and taste. Merriam-Webster’s Words At Play has an extended usage note on beg the question, citing this post in its helpful overview of the different senses and their status. This entry was posted on Wednesday, December 9th, 2015 at 8:50 pm and is filed under language, language history, phrases, semantics, usage, words, writing. You can follow any responses to this entry through the RSS 2.0 feed. You can leave a response, or trackback from your own site. Those who insist on the philosophical sense are those who wish to impress us with their learning rather than tell us anything useful. At the same time, I don’t use the expression myself and regard it as a cliché in others. There is that, though I don’t think it’s always the case. Some people having learned the philosophical sense resent that information becoming useless or baffling in general use. Or they may hate the idea of the phrase gaining a sense based on error and misunderstanding, even if it’s more logical in its way. I’m most grateful to you, Stan, for going into this question which has had me vaguely worried for some time (= decades). All now seems clear, but for one thing: surely the sense in which the expression is being used is clear from the presence or absence of further specification? (For the sake of simplicity (convenience) I disregard the ‘evade’ sense.) That is: if a passage ends with ‘begs the question.’ it is the original sense, and if it ends with ‘begs the question: [followed by a new question]’ or ‘ begs the question of [followed by a new question]’ it is the ‘new’ sense. Or am I still missing something? You’re welcome, Harry. Yes, the phrase is very seldom ambiguous in context. Used in the raise the question sense, it’s usually followed by the question referred to or by some statement of uncertainty. But the traditional, assume the conclusion sense is still apt to cause confusion in some contexts simply because it’s obscure and non-compositional. So the common meaning is annoying to a few, and the traditional meaning is opaque to many; either way it’s distracting. This is why it’s considered skunked. Eh, it annoys me that when I use it in the traditional sense, people will misunderstand me, so I just don’t use it in that sense, nor do I use it in any of the later senses either. The hell with it. There’s a case to be made for switching to assume the conclusion, at least in some situations. Some will object on principle to the idea of abandoning the traditional usage, but there’s virtually no chance it will regain ground in common currency. If only the original phrase in logic (in English) had been “beggars the question,” we might have had more success. True, the verb to beggar would have to be translated as “to make poor or without value,” but from there we can proceed to explain that the charge against a line of reasoning that it “beggars the question” might be more easily understood as flawed reasoning. IMHO. Possibly, Kathleen, though it may be too much semantic load for a little-used verb to carry. I’m really disconcerted by all this. I must be word blind because I can never recall seeing the phrase used to mean “raise the question”. If asked I would say that, basically, it means the technical meaning but that in general it is used to mean “evade the question”. That’s quite strange, Bev. Your experience of it does seem strikingly at odds with other people’s. Maybe you’ll start noticing it in the raise the question sense more now, having been primed to. My general understanding/usage of it is that it means “raise the question” if you reduce it to one short phrase, but with the implication that the question is one that should have been obvious to the writer of the original statement being referenced and was ignored for one reason or another. So “evade” isn’t the main definition, but it’s kind of part of it. That’s sometimes the case, but the phrase is often used with no implication of the question being ignored or evaded. Hmm. I’m not sure how my use of that word would affect what I wrote about beg the question, but I hope you clicked through for context! My only quibble here is with your claim that “the conservative group in this case includes Dinosaur Comics.” The evidence you provide shows only that the character of T. Rex in that comic is in that group, while the comic itself holds him up to ridicule. Fair point, but it doesn’t take into account the mouseover text (DOWN WITH DESCRIPTIVISTS IN THIS ONE PARTICULAR INSTANCE), which suggests Ryan North sides more with T. Rex. But I wouldn’t presume to know for definite either way. I don’t take the mouseover text as being intended to represent North’s actual point of view! Probably wise! At first I wrote ‘Dinosaur Comics’ there, but it seemed off. So who should we attribute that opinion to? I’d suggest going with “The conservative group in this case includes the character of T. Rex in Dinosaur Comics,” which is certainly the case, and leaving the hovertext where it is. I think we can get by without explicitly taking up the question of whose point of view the hovertext represents. I’ve made a minor edit to the post to acknowledge the uncertainty. Great post, Stan, but I don’t think I’d agree that the word is virtually useless. Obviously it’s quite useful to all the people who use it and understand it in the newer sense. It might have diminished usefulness to those who adhere to the traditional sense, because they can’t be sure that their audience will understand unless they’re writing for other academics. And I really dislike the term skunked, because it basically says to me, “If people can’t use it the way I want, nobody should be able to use it.” I don’t think such a tiny minority should get to declare a word off-limits for everyone. On a side note, I wonder how the different meaning shake out for beg the question, begged the question, and begging the question. Thank you, Jonathon. I don’t think it’s virtually useless either, as Grammaphobia claims. On another page the same writers say the expression ‘doesn’t mean much of anything’, which is not the case at all. It just means different things to different people. Your interpretation of skunked is different from mine, though: for me it means a disputed usage is at a stage of change that makes it especially confusing or distracting, to the detriment of a text. I wondered the same thing about the other grammatical contexts, but I didn’t feel like spending another couple of hours on it. Maybe some other day. I think it is unhelpful to see linguistic matters in terms of right or wrong. Isn’t it the case here that the ‘more erudite’ usage is simply a more precise subset of the more general meaning? I would argue that all lexemes have this structure of a more precise core and a fuzzier periphery and the boundary between them shifts over time. So the interesting questions here regard how, why and to what extent more precise meanings consolidate or dissipate over time. According to this model, both prescriptivists and descriptivists are ‘right’ to some extent. Even the concepts of ‘right’ and ‘wrong’ are fuzzy! I agree. Correctness in language is not absolute, despite the popular belief that it is or should be. How ‘correct’ a usage is depends on context or what some linguists call ‘correctness conditions’. I touch on this topic quite regularly, for example in a recent post on reconciling descriptivism with editing. No one’s claiming it does – yet. The first time I noticed the phrase “begging the question” — in a religious book published in 1984 — it was used in (some corruption of) the traditional sense, whereas practically every use I’ve seen since hasn’t been. This is not surprising, because no doubt the very thing that made me notice it was that the meaning wasn’t obvious from context, whereas I might have overlooked any number of prior encounters if they didn’t present a puzzle. One thing I’ve never been certain of is how the traditional use should be delineated, because there’s a continuum from literally assuming the conclusion, to assuming not so much the conclusion as the main point of contention, to doing so without being aware that it *is* the point of contention, to simply assuming *a* point of contention (as in practically every argument ever). Whether an argument begs the question or not seems to be more a matter of perspective than any intrinsic property of the argument itself. The precise nature of the fallacy deserves a clear and thorough exposition, since there are various forms of it. I’m not the best person to do this, though. You might find the following pages of use or interest: Lander University; RationalWiki; Fallacy Files. It is impossible to use words to define any word without already knowing what the words we use mean, so how do we use words to define the words that we use to define a word? A question begging for an answer. For most words meaning emerges over time; it doesn’t appear in an instant. So we work from what we already know. Count me as one of the distracted readers and that, like Harry Lake commenting earlier, for decades. My problem wasn’t that I knew what it could mean or should mean (what’s that you say? look it up?) but that it didn’t seem to mean anything at all. I’d see the phrase and get a mental image of the statement in question panhandling. Who it was begging from? And why? Even more mysteriously: how? For literal-minded innocents like me, just ditch the stupid expression. I’d say it hasn’t been skunked. It was always a skunk. When people mean “raise the question” they should say what they mean. And likewise for “assume the conclusion.” The relief would be great. So many sleepless nights avoided! As for why, I imagine it struck users as idiomatic. The use of beg meaning ‘raise’ (a question, an issue, etc.) might not have been a perfect fit, but it was in the semantic ballpark where beg ≈ ask. Once it became a cliché the association of phrase with meaning was bound more closely. But like you, I avoid using it altogether. There’s a case to be made for switching to assume the conclusion, at least in some situations. Or petitio principii, if you really want to show off your erudition. The figure of 90% that I reached after looking at 300 examples is, if anything, probably conservative, given that 3 out of the 23 traditional cases were from the same person in the same comment. And the philosophical usage seems highly unlikely to regain ground: if anything, it will keep fading except in philosophical and similar contexts – and it would be interesting to see if it survives even there in the long term. I agree that a lot of peevery is about bewailing such change and doubling down on lost causes, as this one is, but it’s not how I tend to use (and understand) the term skunked. Also, some peeving can stem from simple ignorance of the facts: Someone may believe their preferred usage is more common than it really is, and once they see it’s a futile hope they ease off on the peeving, however reluctantly. I’ve seen this happen. The point being that peeving is not always about defiant snobbery and pride in one’s learning, etc. ; it can be about a false notion of what is correct (and what correctness is). Eh, you’re much more willing to be generous to peevers than I am. I see this a lot among people professionally concerned with language — an apparent eagerness to bend over backwards, to concede as much ground as they feel they can in good conscience, and treat each bit of peevery as a potential learning experience. Which is admirable! But I can’t do it; I wasn’t cut out to be a teacher (I tried), and to me peevers fall into the same bag as various groups that I won’t name for fear of being inflammatory: each individual member might be a good, well-meaning person who happens to be misinformed, but the odds are low, and conservation of (my own) energy drives me to label the entire bag as “Jerks” and let it go at that. Fair enough, Hat. I know some peevers and many of them aren’t jerks, so I don’t automatically conflate the groups. Plus, I’m a reformed (mild) peever, so I know it’s possible to renounce one’s sticklerism. It makes sense to me to give peevers the benefit of the doubt unless I know they’re die-hard cranks, and I don’t think insults and hostility tend to help win over potential converts. But there are times, online and off, when I realise it’s futile. Occasionally I trash comments submitted to this blog because I can see it would be a waste of time even engaging. Occasionally I trash comments submitted to this blog because I can see it would be a waste of time even engaging. I, too, didn’t like the “misuse” of “begs the question” … but I am changing my stance. It seems logical that if someone is discussing a point, I might be tempted to say “Your comments are begging me to bring up the obvious question, which is …” which I think could be shortened to “begs the question”. The question is begging to be asked. I don’t think it’s a new meaning of “beg” meaning “evade or sidestep”. It’s not a common use of the word, but it is distinct from the other senses. “Correctness changes with sufficient usage”. I’m wondering if this statement is (ironically) begging the question: you are essentially saying “This is now correct because this is now the commonly accepted usage”, but another way of saying “the commonly accepted usage” is to say “the correct usage” (because what is correct in language is determined by what we commonly accept). So aren’t you really just saying that “Correctness changes because correctness changes”? If so, I think you are begging the question! Maybe, Jo, but I don’t think so. The phrase you quote isn’t just saying ‘correctness changes because correctness changes’: it’s summarising how correctness changes – through sufficient usage. The fact and means of correctness changing are very often missed or rejected by traditionally minded commentators on language. I mean the ones who say that even if 90% of people use X, they are wrong if X is felt to more ‘correctly’ be something it once predominantly was. I had hoped this point was sufficiently clear from the context surrounding the few words you quoted, but perhaps it isn’t.